Blog post details: c/o Walmart Thomas the Train Super Station, Elijah: red polo shirt (similar here) and khaki short (similar here). Debbie: white top (similar here) and denim jeans (similar here). 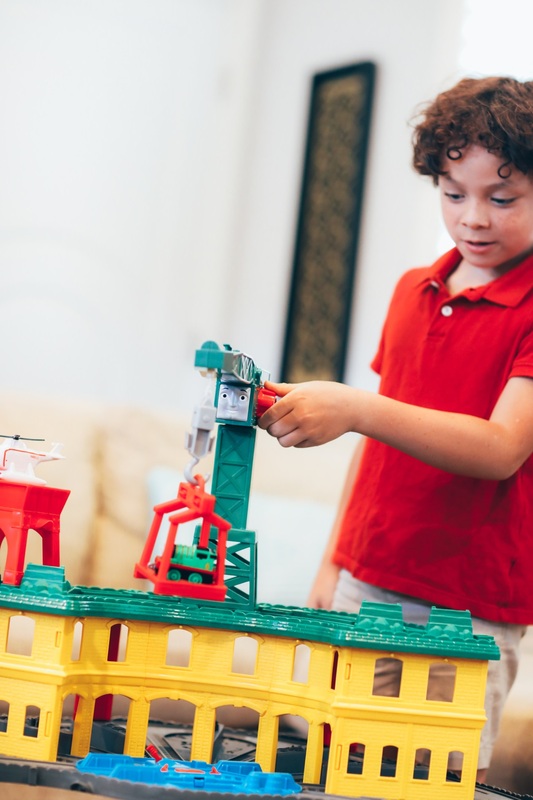 Today, I want to share a new toy that my son, Elijah, LOVES – and I know your child will, too! It’s the Thomas & Friends Super Station playset, available at Walmart! 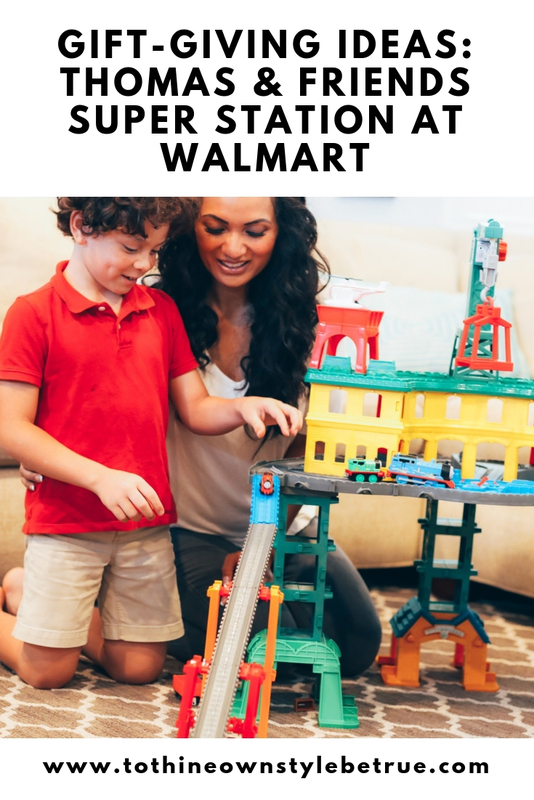 We love shopping at our local Walmart every week for exciting new finds – they also have a wonderful toy selection that my son adores. Elijah hasn’t stopped playing with the Thomas & Friends Super Station and absolutely loves it! 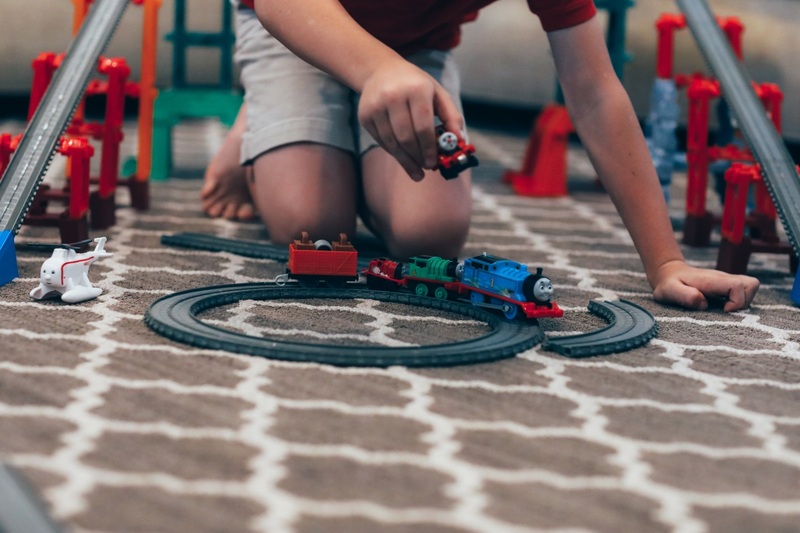 Not only is he a major train enthusiast, but this toy also creates family time, allows us to play together, while still giving him room to use his imagination. 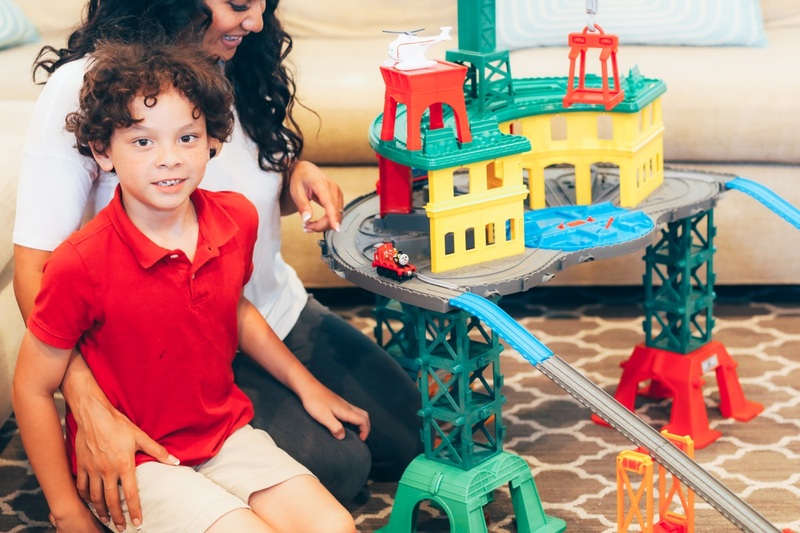 When we use our Thomas and Friends Super Station playset, we’re able to spend time as a family, bond, and make amazing (+ fun!) memories. 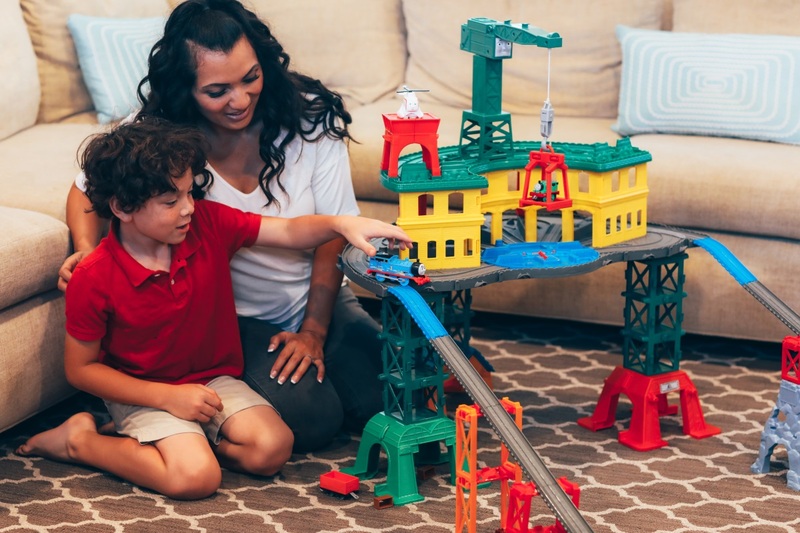 This awesome playset also features two racetracks, plus floor play that has a turntable with a stop-track lever, track adapter (so you can connect more than one set! 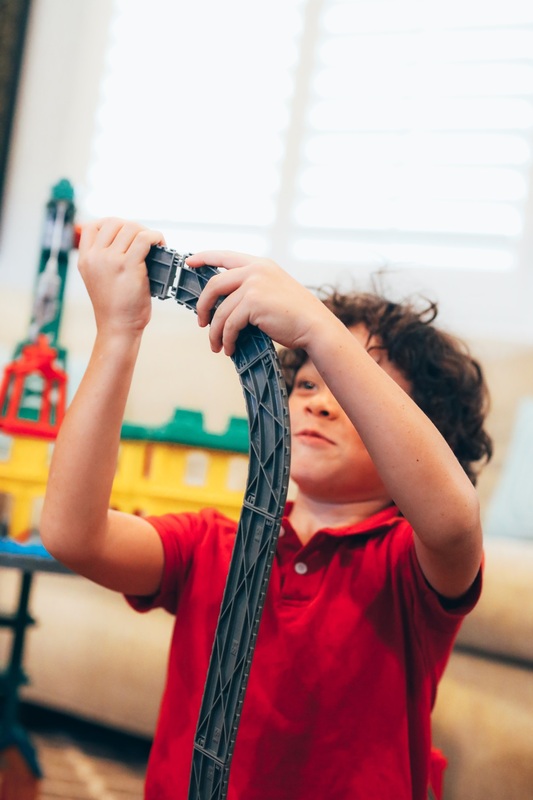 Elijah loves this feature), over 35 feet of track, and it holds over 100 engines…so play time is seemingly endless! Not only is this a great toy for family time, but it also keeps my son entertained for a long time. 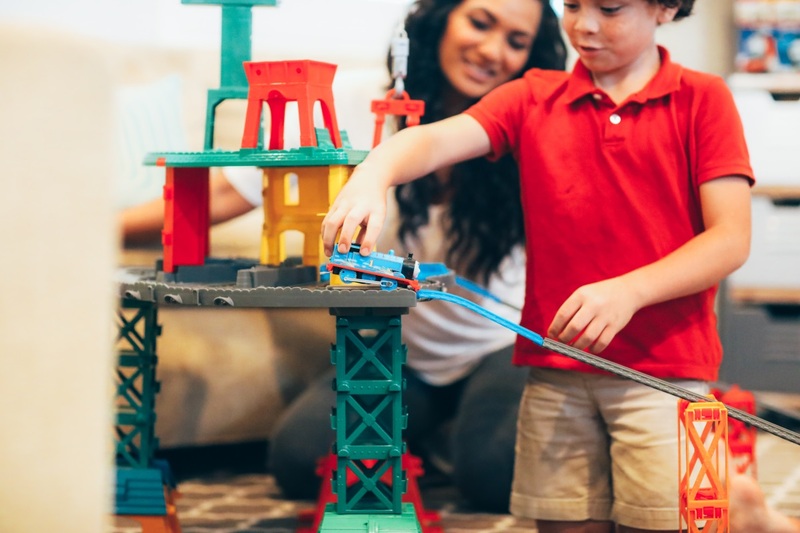 The Thomas & Friends Super Station makes a wonderful addition to playdates or single play, as it’s highly entertaining but still allows children to use their imagination. 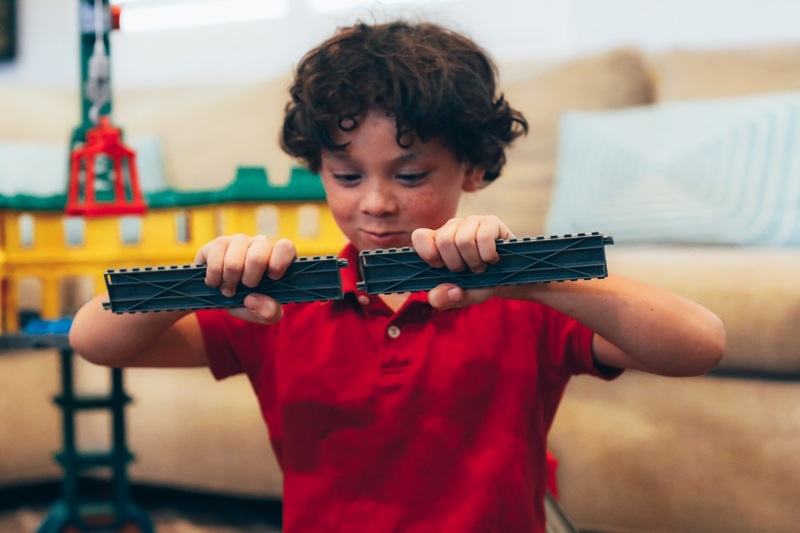 It also works with any size Thomas engine scale, so if your child’s friends bring their Thomas trains over, they can use them with this set, too! Oh, and a bonus? 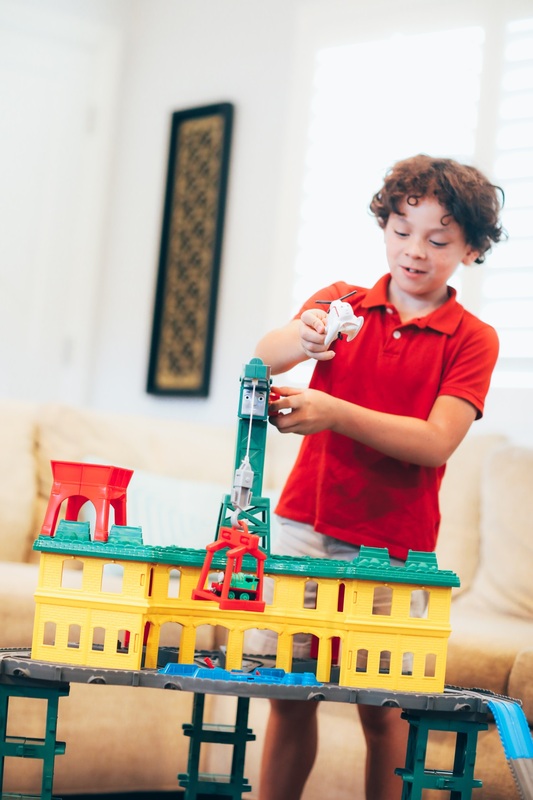 You likely already know how I am about keeping the house neat and organized…this toy set can be configured to fit almost anywhere in the house (yes, anywhere!) making clean-up and tidiness possible. For this fact alone, I may love this toy more than my son does! As you can probably tell, I only have good things to say about this Thomas & Friends Super Station playset. With just 78 days until Christmas left (um, how does time fly this fast?! ), this is the perfect toy to pick up for all your favorite little people in your life. Even though my son already has this toy, I’m already brainstorming what Thomas set to get him for Christmas…to add to his Super Station! Tell me: What do you think about this super cool new toy for our beloved little ones? 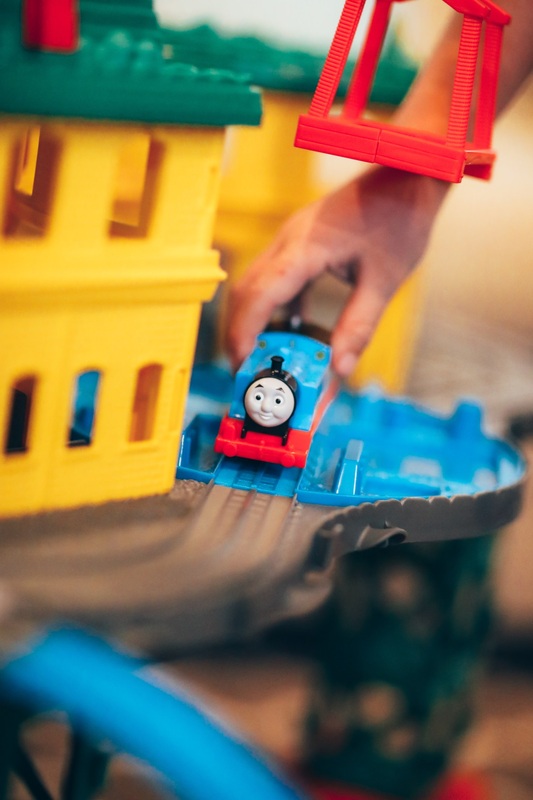 Does your child already have – and love – Thomas and Friends toys? 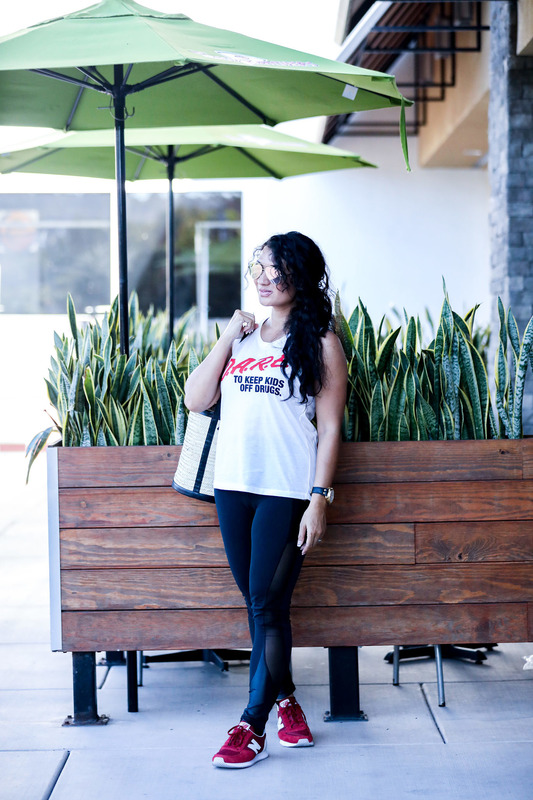 What are a few of your favorite gift giving ideas? Let me know in the comments below! Oh my gosh, adding this to my boys’ Christmas list right now! They love their train set and would go crazy over this addition! We already have two huge bins full of the wooden trains but you can never have too much! I am so glad! It is so awesome that it is available at your local Walmart or can be ordered online Thanks for stopping by! My son is so obsessed with trains. it’s hilarious because he now lines every thing up like it is a train track. Hi Jennifer! Your little man would love this! Christmas is coming I’m not sure yet what is best gift for my godchildren HAHAHAHA! Nice toys! I’m pretty sure your son he loves the train toy. Elijah does LOVE playing with his Super Station! Aw my kiddos would love this! I’ll have to remember this for the coming holidays. This looks like a great Christmas present for a child who loves trains – my nephew would like this! My three year old, who is obsessed with Thomas, was looking over my shoulder when I was reading this, so I guess I’m adding it to his Christmas list! This will be so much fun for him! Hi April! I promise you they will love it! This looks like such a fun toy! My son loves Thomas the Train too. I will have to keep this in mind for Christmas! This looks like so much fun! I’d love to get this for my nephew… and get to play with it, too! That looks like a really neat train set! You can tell that your son is absolutely in love with it, and having such a blast playing with it! Oooh! Such a cool train set. I know something like that will be enjoyed by my nephew. Thanks for sharing. Wow I’d love to gift this to my little nephew… looks like so much fun!